FRESH BREAD daily for 96,000 soldiers, more than double the old equipment’s capacity, is turned out by the new mobile bakeries developed by the Army’s Quartermaster Corps. Each bakery company, with three mixing and make-up trailers and six oven trailers, can now produce the two-pound loaves at a 20-per-minute rate. The men eat an average of 1/2 pound apiece daily. The stainless-steel dough troughs, each holding 492 pounds, are insulated to hold their contents at a fixed temperature during the monorail ride from the mixing bowls. Measuring and molding of the loaves is done mechanically. From the ovens, the loaded pans move over skid-wheel conveyors to storage racks where they are left to cool for two hours. The complete bread-making process takes four hours, including two hours for dough fermentation. 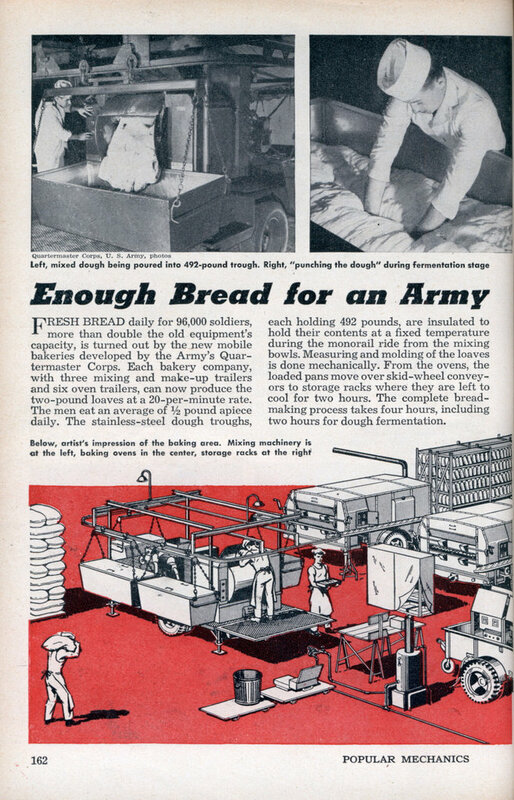 So you CAN make dough in the army!